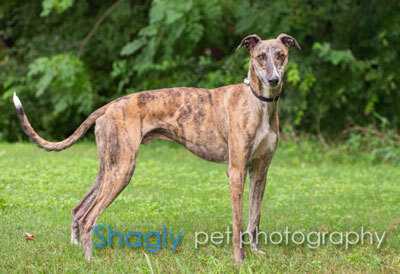 Deputy is an estimated 2 year old brindle male with a handsome white streak accenting his nose. He was found as a stray in Tulia, TX, so no background is known for him. Deputy should not live with cats, but It is not known at this time if Deputy is tolerant to other small animals. From the moment we met Deputy, we knew we were going to be fostering a special pup! His off-center striping on his chest and nose, along with the white “socks” look on his feet ,give him an undeniably quirky, yet handsome, look! Deputy has been through training with another foster to learn proper manners when he meets new friends. He tends to do well with a female 4-legged buddy. With reinforcement and continued training, he can now perform the basic commands, such as sit, stay, leave-it, and lie down (including instructions to lie down on a dog bed). Deputy is highly treat and praise motivated. Deputy immediately acclimated to our home after performing the usual sniff around and has had no interest in marking indoors. When not napping and roaching, Deputy plays non-stop with the mountain of dog toys in the house and enjoys running laps around the yard with our own dog! 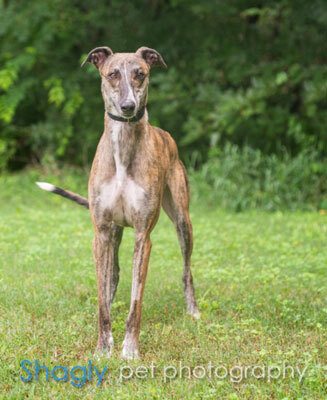 Deputy has a high energy level for a greyhound and would have no problem with long walks or jogs. Deputy’s ideal home with have no cats, an active female playmate to keep him company, plenty of toys for entertainment and a backyard to play chase. Due to his excitement level, he would do best with older children. This is a happy boy who wants to please his people and will keep you smiling at his adorable face.